The tropical storm Harvey that hit the Gulf Coast of the United States has wreaked plenty of havoc and displaced thousands from their home. In Houston, Texas many have lost property, been cut off from power supply and worst still, left stranded as flood waters continue to rise. It’s the typical time when people come together to seek ways to make life easier for those directly affected by a disaster. Apart from rescue operatives, law enforcement agents and non-governmental organisations who by the demands of their jobs unarguably have a responsibility to alleviate the effects of such unfortunate occurrences, it’s a time where religious bodies and ordinary citizens have the chance to demonstrate love for their neighbour.As rescue efforts go on and people are evacuated from high waters to shelters, schools, religious centers, and even individual homes, it’s clear that more help is needed especially with respect to securing temporary accommodation for the many who are yet to be settled. In the midst of all the hubbub sits 17,000 capacity Lakewood Church. The Protestant church presided over by Senior Pastor and popular televangelist, Joel Osteen. A place of worship where people go to “feed” on the word of God. What has come as a surprise to many is that the church which can house at least half of the population of those who have been displaced by Hurricane Harvey remained shut in spite of the glaring need around it. Social media went agog, with not a few expressing their disappointment that Pastor Osteen did not deem it urgent to open the doors of the church to people who would have been more than grateful to camp in it. I have read countless tweets and a couple of reports about the storm and the non-responsiveness of the mega church which should have been at the forefront of offering succour and comfort at this time. For many, what added insult to injury was the statement from the pastor denying the claims that the church shut it doors to the public, and further going ahead to declare that it would be a distribution center for relief materials first of all, before offering to house evacuees when shelters reach full capacity. Before the statement made by the church, I had wondered if the strong reactions to the matter was not simply a case of making a mountain out of a mole hill. I read the comments and backlash with some level of cynicism until I read Pastor Osteen’s response. It was disappointing, it was not well thought out and it was an indication that religion had failed some set of people yet again. At first, there were counter arguments that Lakewood church and its environs were flooded too, and as such could not have opened its doors to the people who needed refuge. This was until pictures and videos surfaced to debunk the claim. From all indications, the church could have indeed accommodated as many temporarily displaced people as possible, but for some reason opted not to do so. A fact they indirectly corroborated in declaring that they would be willing to let people in at a later time. 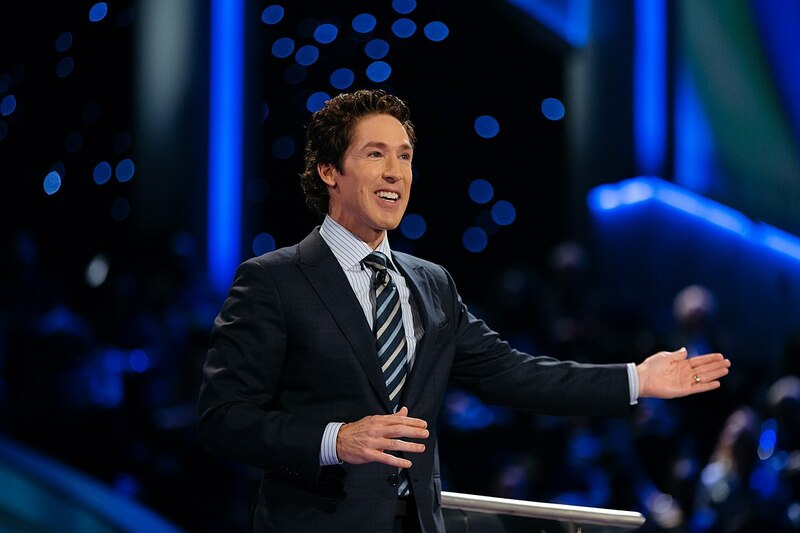 Pastor Joel Osteen has come under heavy criticism for his apparent insensitivity, and quite frankly it’s hard to fault those who have nothing nice to say about him or Lakewood Church at the moment. I am a Christian, and as far as I know, apart from its primary responsibility to preach the gospel of Jesus Christ to those who are yet to receive it, one of the core duties of the church is to give aid to the needy – People in pain, people who are hungry, people who are in one form of discomfort or the other. And not to get all preachy, but there are countless examples of Jesus’ altruism in the Bible; Several situations where he cared for and fed people to show us exactly what to emulate. The devastating effects of Hurricane Harvey offered the perfect opportunity for Lakewood church to express the kind of love the Bible teaches. What better way to get people to believe what you say than to demonstrate it to them? I don’t know of anyone who doesn’t respond to love, and if Lakewood Church had been at the forefront of securing a place of abode for victims of the flood, I dare say that members would not need to say a word by way of preaching or cajoling people to come to church before the church witnesses an unprecedented number of new worshippers at its services. It’s the same situation we are bedevilled with in these parts. Clergy men not practicing what they preach. “Men of God” living in opulence while the congregation they guilt trip into parting with their hard earned cash wallow in penury. Prosperity crusaders and money-mongers who raise their voices when it comes to the subject of money, but gloss over acts that truly depict love. I am almost certain that some members of Lakewood Church were also affected by the flood, people who pay their tithes and offering to the church, yet were locked out when they needed the church the most. It’s why it’s important to develop a personal relationship with whatever deity one worships instead of following religion blindly. At the base of religion itself is the charge to always to do good. I don’t know of any religion that encourages its followers to turn a blind eye to other people’s suffering regardless of their race, class, political beliefs or creed. Therefore, it is apparent that when clergymen who are supposed to be foremost custodians of the tenets of the faith they proclaim behave unseemly, they are simply acting out their own script. Unfortunately, for the undiscerning, this sort of bad publicity would serve a negative poster child for other churches, especially when one considers that the church as a whole does not exactly have a stellar reputation at the moment. A swift reminder of ISIS and Boko Haram (who also claim to be fighting for Muslims when they reign terror on hapless citizens), coupled with the misadventures of modern day pastors is enough for them to cast a vote of no confidence against religion. PreviousPrevious post:5 Things You Must Know About Lagos and LagosiansNextNext post:Can We Disagree In Peace? Another fantastic piece by the ever cerebral writer!! Very objective and articulate, yet, bares the truth of most religions today. If only people can think for themselves and truly study the (in this case) Bible and indeed, other book’s love oriented teachings. There wont be much problems in the world today. Thank you for the piece. Keep em coming! High praises, Bayo. Thank you so much. Balanced analysis. Fangs exposed on both ends. Great piece Lolade. It’s jst disappointing that the Church did not live up to expectations. As u rightly stated, this event presented the Church with an ideal opportunity “to display her wares”…..unfortunately, she didn’t take it. Sadly, it didn’t at the time when it could have been the people’s hero. Thankfully, the doors were eventually opened to evacuees. Thanks Anthony. Nice piece Lolo..there is now a thin line between sleek sweet mouthed “men of God” and those who actually know WWJD if he were in those shoes.the Church now more than ever needs to do away with religion and preach Christianity and the love for humanity..one again, nice piece. On a lighter note, I just learnt a new acronym from you, WWJD = What Would Jesus Do. Hehe! Thanks so much, Laitan.